Soil moisture sensor controllers are placed below ground in the root zones of lawns and landscapes to determine if and how long to water. They are available as stand-alone controllers or add-on devices to existing controllers. They have been shown to reduce outdoor water use by up to 70% without sacrificing the quality or health of your landscape. Irrigation supply houses throughout Orange County (such as Ewing Irrigation, Site One, and Imperial Sprinkler Supply) carry rebate-eligible controllers. Residential Rebate Level: Up to $80, or more in select areas, for properties less than one acre; OR $35 per station for properties at least one acre or greater. Rebates are subject to availability and retail water agency participation. Click here for a list of rebate-eligible residential soil moisture sensor controller models. Commercial Rebate Level: $35 per station for all properties. 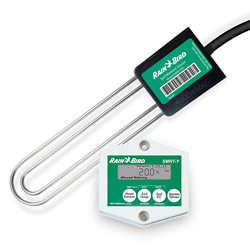 Click here for a list of rebate-eligible commercial soil moisture sensor controller models.